Natural building is a focus at Rancho Mastatal. We take pride in designing and building our own sustainable homes to minimize the impact on our environment and maximize their sustainability. We use local labor and resources to not only build our infrastructure but also community. 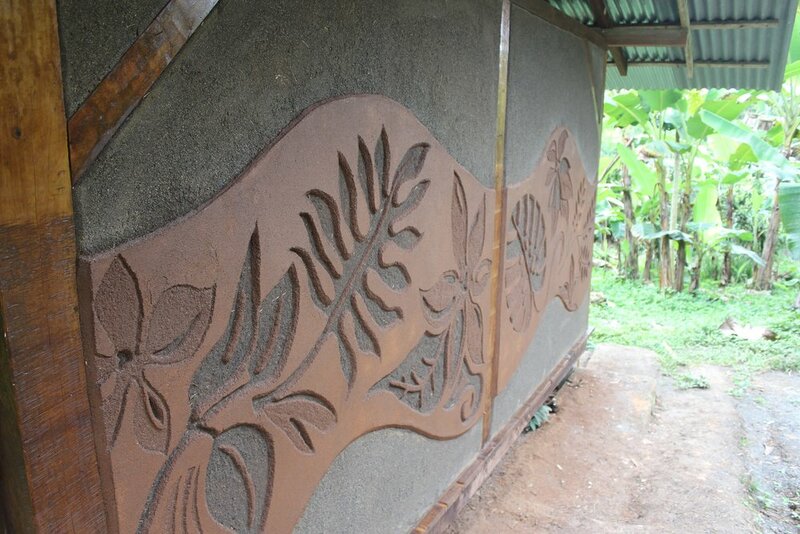 Building with native and unprocessed materials is an empowering experience. We strive to partially curb the tide of constructing primarily with concrete, a common practice throughout Costa Rica and a material with an enormous carbon footprint. We are one of the leaders in the sustainable home field in Central America and welcome you to join us to learn more about green building and green living. What follows are brief descriptions of some of the natural building materials and techniques that we use at the Ranch. For more information about our naturally built sustainable homes, please continue reading and looking or click here. To stay in one of our naturally built sustainable homes, please see our Accommodations page. Wood is an abundant material in our area that we use extensively for our sustainable homes. This incredible, renewable and relatively easy-to-use resource is a mainstay in our building infrastructure. All the wood that we utilize in our structures is sourced and milled in our region and oftentimes from and on Ranch property. This abundant material is one of human's oldest building materials and used regularly for Ranch building projects. It has enjoyed a resurgence in recent years throughout the world as builders and homeowners better understand the variety of benefits of using this ubiquitous material. 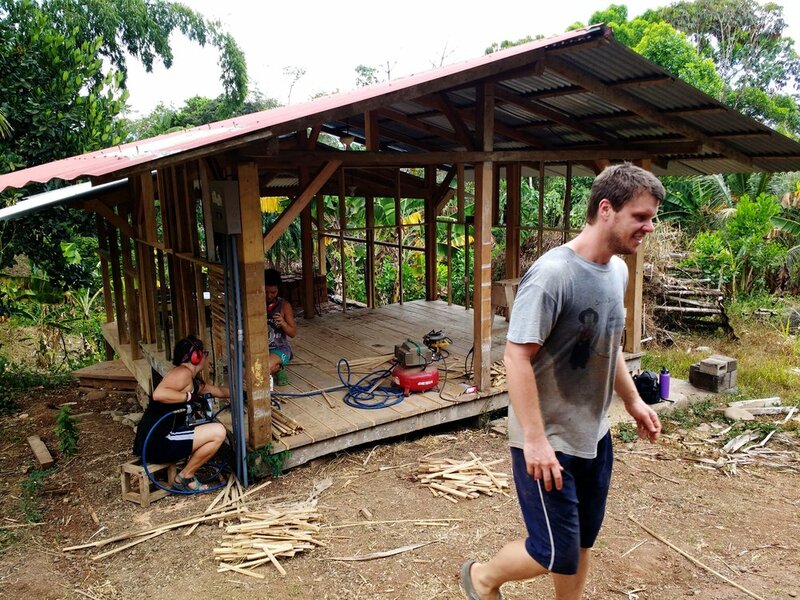 Costa Rica has a history of building with earth using a technique called bahareque or wattle and daub and Adobe, and we are proud to be a part of the movement of reintroducing earth as a commonly used building material in our adopted country. We collect straw after each rice harvest and gather strong natural grasses from the roadsides and pastures in and around Mastatal. The materials are free and plentiful. Once dried in the sun for a few days, these materials are used in our floors, cob buildings and wattle and daub walls. In cob construction, the straw/grass acts as the rebar would in a concrete structure. It essentially holds everything together. Bamboo has become one of our favorite building materials over the years. Even though at this point in time we purchase much of the bamboo that we build with from a friend's farm, we have planted a great deal of this magical grass that we use for a variety of building and non-building applications. Bamboo's versatility, functionality and flexibility are unbelievable. When you visit the Ranch, you will see that we use bamboo for just about everything, from posts that hold up a building to pencil holders. We have worked a great deal with Martín Coto, one of Costa Rica’s most well-know bamboo builders. He has endowed us with a number of techniques that we have been using for many years now. Bamboo is strong, sustainable, and an appropriate resource to build with in the tropics. We utilize rocks and stones from our local rivers to build and face foundations and for multiple permaculture applications. It is an abundant and beautiful resource. Working with stones can be a mesmerizing and intensely gratifying experience. “Rock runs” are a common and popular activity at the Ranch and oftentimes include an elongated dip in one of our beautiful waterways. 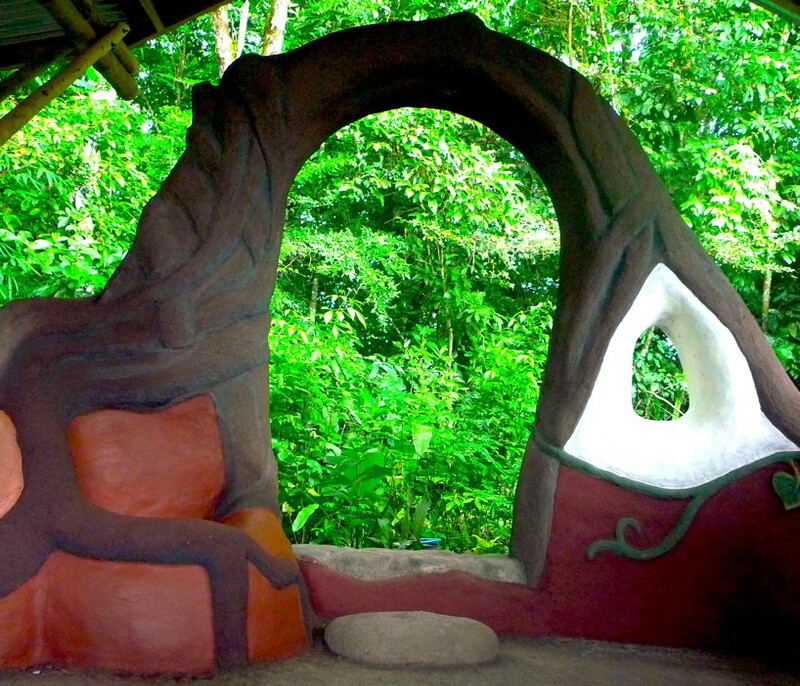 Cob is ancient method of building that utilizes clay, sand and straw or other fibers. 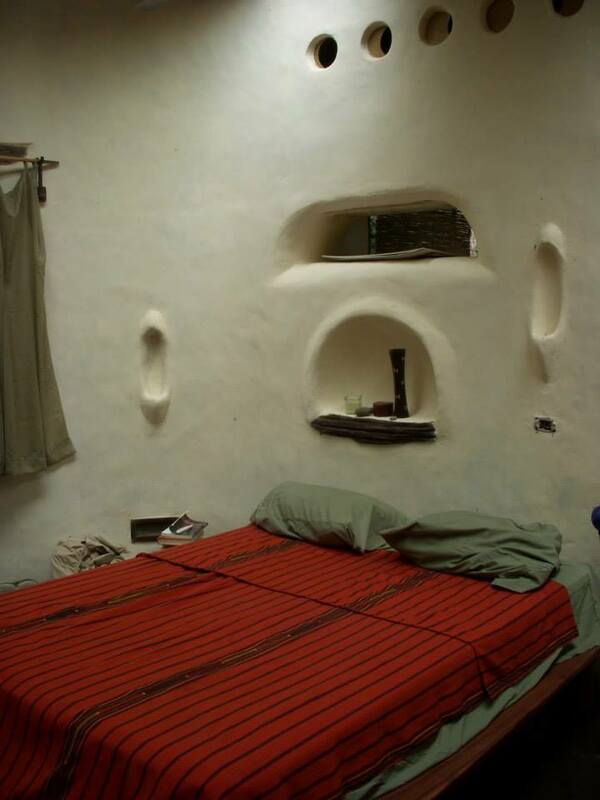 Cob homes are common place throughout Europe and the World and we have some beautiful examples of load bearing and non load bearing cob around the Ranch. The raw materials are mixed thoroughly together, in our case with our dancing feet motivated by a bit of bluegrass or rock and roll, and then applied wet by hand. For the fibrous material, we harvest a plentiful and incredibly strong grass that grows along roadsides. Our sand either comes from local rivers or nearby quarries. Cob seems to be making a comeback throughout the world and we are pleased to be leading the charge in Costa Rica. Earthen floors add a great earthy touch to your sustainable home; whether that’s in your cob house or conventional stick frame home. They have more give than concrete or tile, meaning they are more comfortable and easy on your feet. Earthen floors can be durable and last a long time and consist of the same simple ingredients as much of our other building materials, sand, straw and clay. To learn more about how to make an earthen floor read our blog article on earthen floors. Adobe bricks are very similar in composition to Cob. The main difference is that rather than applying the mixture to the wall whilst wet as you would in cob construction, you place the mix into a wooden form to make a brick and leave in the sun to dry. These can then be stacked like conventional bricks using an earthen mortar. In the older parts of Costa Rica adobe houses are still around and there is growing movement to work in restoring them. Wattle and daub traditionally consists of a woven latticework of flexible wooden or bamboo members called wattles that are daubed with a mixture of mud, clay, animal dung and chopped straw. It is normally whitewashed to increase its resistance to rain. This is a technique that we have been incorporating more and more into our buildings. It is a wonderful system for non-structural walls and goes up relatively quickly. We have been using bamboo for the wattles and a mixture of clay, sand and straw for the daub. In this blog article we outline our current wattle and daub building methods. 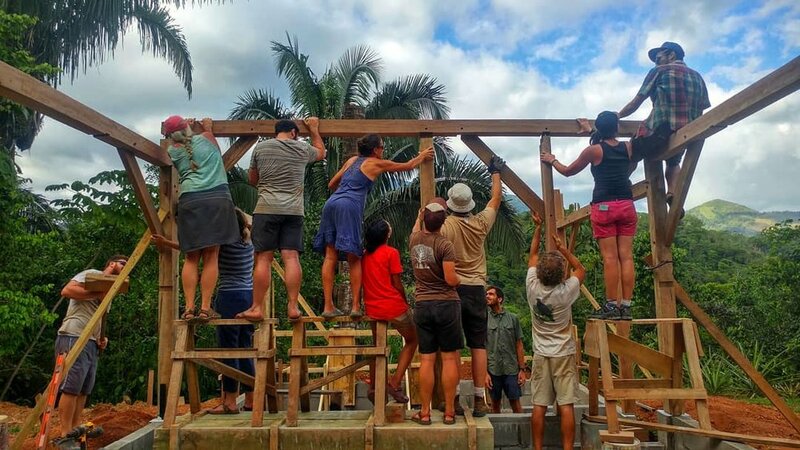 The rainforests of Central America might not be the first place that you think of when you hear the term “timber frame construction” but this age-old technique of joining large, dimensional timbers using mortise and tenon joinery and wooden pegs has become one of our most popular building styles. Attractive and gorgeous timber frame buildings dot our campus and community and thanks to our close building friends SKIP DEWHIRST and LIZABETH MONIZ who introduced us to timber framing in 2007, we have become quite proficient over the years building at this way. 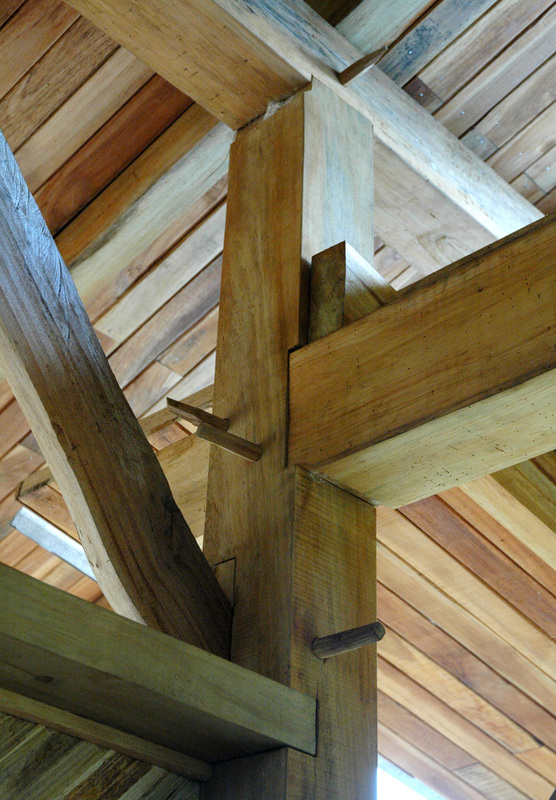 Read an excellent blog article on timber framing at the Ranch here. In the past we have used burnt lime (quicklime) purchased from a regional kiln, to make our own lime putty, we now buy powdered hydrated lime. These two products can both be made into plasters, renders and paints. Lime is making a resounding comeback with natural builders. Roger Whalley, after taking a lime plaster course in Wales in 2004, came back to the Ranch brimming with excitement about the possibilities of working with lime. He spearheaded the movement to incorporate lime into just about every new building project at the Ranch. Since then we have hosted many natural building experts and plasterers from around the world including Liz Johndrow, Ryan Chivers, Bill & Athena Steen, Kyle Holzeuter and Benito Steen. Their knowledge and inspiration have helped the Ranch develop a huge array of examples of natural plastering techniques. We have over 30 covered structures that make up the Ranch infrastructure a number of which are sustainable homes. Aside from two buildings that we renovated upon arriving to Mastatal, we have designed and built all of our structures. We are not architects or professional builders and try and demonstrate as best as possible how each and every one of us can participate in the design/build process. We thank Yestermorrow Design/Build School in Warren, VT for instilling this philosophy in us. The Ceiba Lounge was completed in 2014 and is a part of a larger structure in the Main House area that is also home to the Ranch whole foods processing and fermentation kitchen or our "Foodsmithery". Jules Davey was the lead builder who made this project happen. The Ceiba, as most people it for short, was made using 5 different earth building techniques including wattle and daub, cob and taquesal. The floor is an earthen floor and the walls are finished with a combination of lime and earth plasters. This space is used mainly as a hangout and meeting space and helps to alleviate some of the people pressure from the rest of the Main house. This structure was built in 2007 and was our first foray into timber frame construction. Since then, timber framing has become of our favorite building techniques. La Casucha is the home of Ranch core team member Jacob Porter. We used locally harvested pine and pilon for the frame, cedar for the floor and teak for the deck frame. The walls are made of a combination of wattle and daub, cedar and bamboo. It's a simple yet awesome structure. 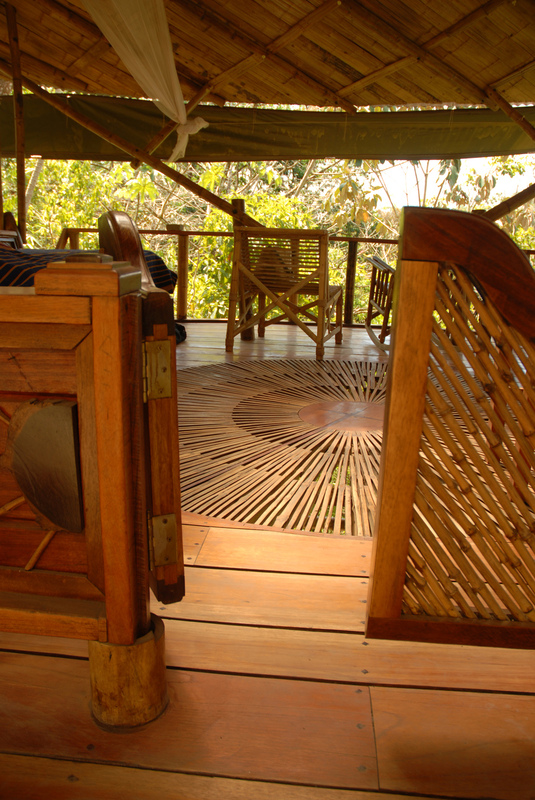 This extremely private cabin sits on the edge of the rainforest on Jeanne's side of the property and provides an amazing space to view wildlife, meditate, do yoga, or to simply enjoy the company of others. 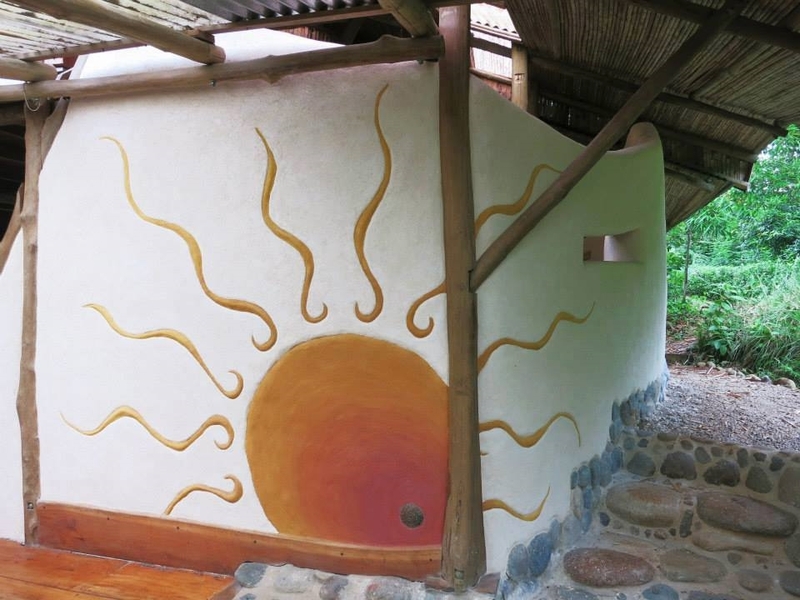 This space is for the more adventurous though it does have access to a beautiful composting toilet and electricity thanks to a small solar array that provides dependable light. The pure beauty and tranquility of the immediate area and the comfortable queen sized bed more than make up for its lack of modern comforts. And for early morning hikers, simply plop out of bed, walk a few steps, and enjoy the solitude and beauty of the rainforest. We doubled the size of this cabin with a sitting room addition built in 2014. This structure is home to two spectacular bedrooms and a beautiful porch with views towards the forest. It’s serviced by a composting toilet and tadelakt shower. The building has electricity and running water. The timber frame structure was designed and built by intern Sam Gibbs with the help of many, most notably Skip Dewhirst, who helped with much of the head scratching and roof details. It's was our first hip roofed building. The incredible apprentice house was designed and partially built by its namesake Rob Hankey, an English legend who spent many months at the Ranch in 2006. 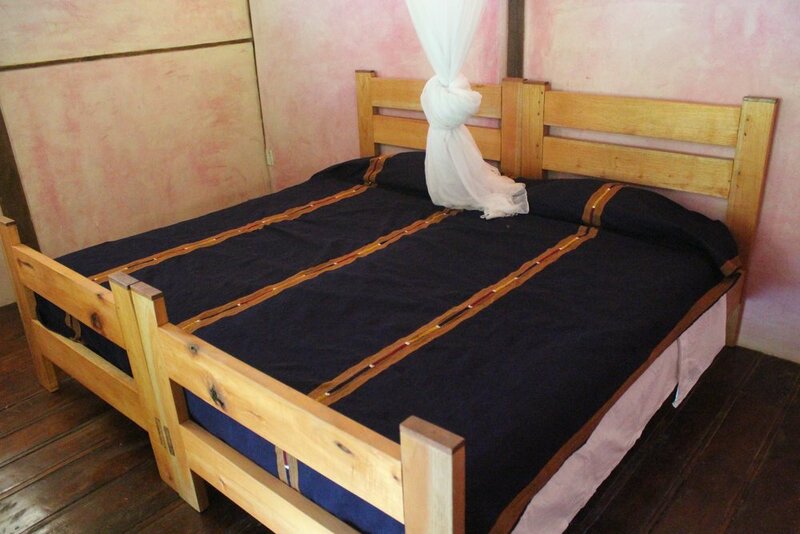 The Hankey is constructed with local materials such as clay, straw, sand, earth, bamboo and locally harvested wood and is home to five double beds with a maximum capacity of 10 people. The house has running water, electricity and a common room with a couch and chairs. It's one of two multi-story structures at the Ranch and definitely one of the most innovative and beautiful edifices on the property. The Hankey House is served by an awesome composting toilet and a gorgeous shower structure right next door. It is also just a stone's throw from our hen house, beautiful orchards, and trails leading into the beautiful forest and to nearby swimming holes. This structure is rented out to guests in the low season. Our 2017 year-long apprentices took on as their primary natural building project renovating our old goat barn into a beautiful living structure for 2 future apprentices. 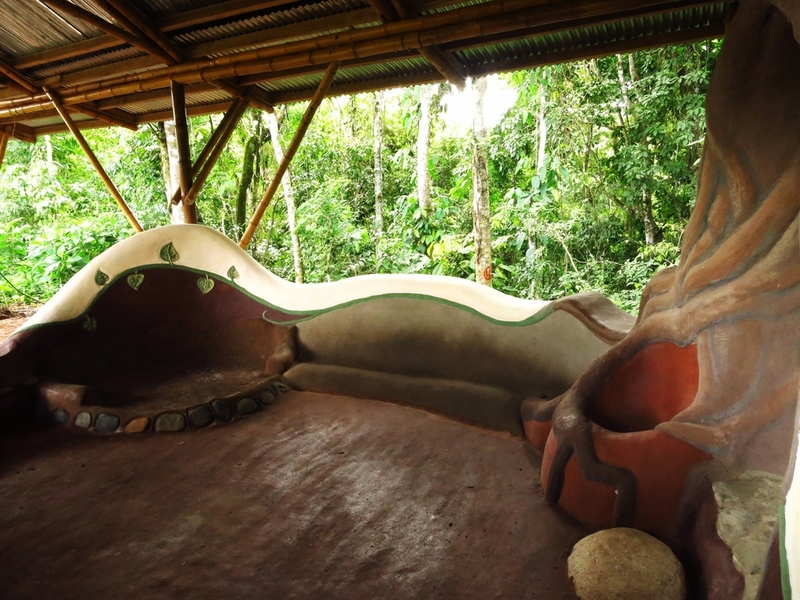 Features include a beautiful earthen sculpture, poor man's tadelakt interior walls, water and electricity, and a wonderful patio looking into the Banana Bowl, one of our primary orchard spaces. We rent this structure when it is not occupied by apprentices. 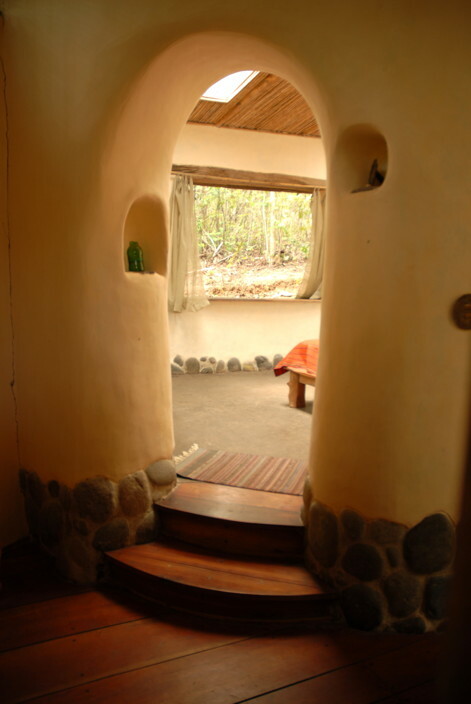 This beautiful handcrafted cob home is where Tim, Robin and Sole's currently reside. It was designed by Robin and built with the help of many hands using cob, wattle and daub, lime plasters, bamboo, locally milled wood and recycled fence posts. 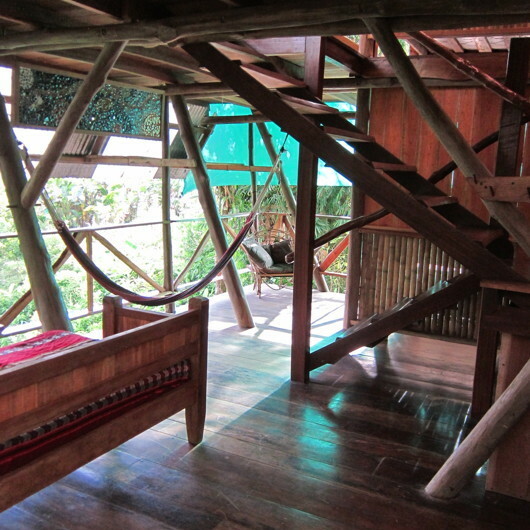 It's a wonderful space featuring bamboo, wood, and earthen floors and two styles of earth construction. 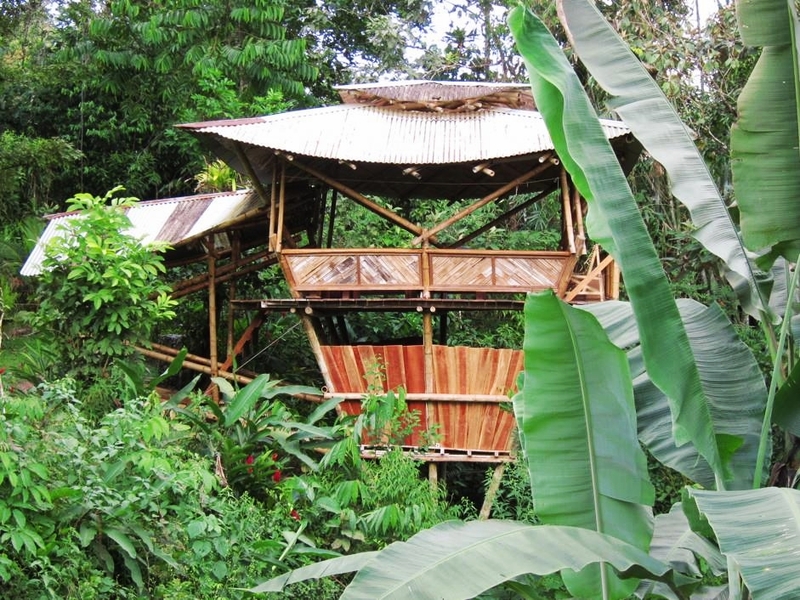 The site is also home to a beautiful earthen and bamboo composting toilet and outdoor shower and fabulous views to the highest point in the La Cangreja National Park. The front yard space is the site for some of the Ranch's bonfires. Our delightful, open-air and spacious classroom, located behind Jeanne's House, provides an awesome space for lectures, presentations, yoga, meditation, studying, reading and hanging out after hours. 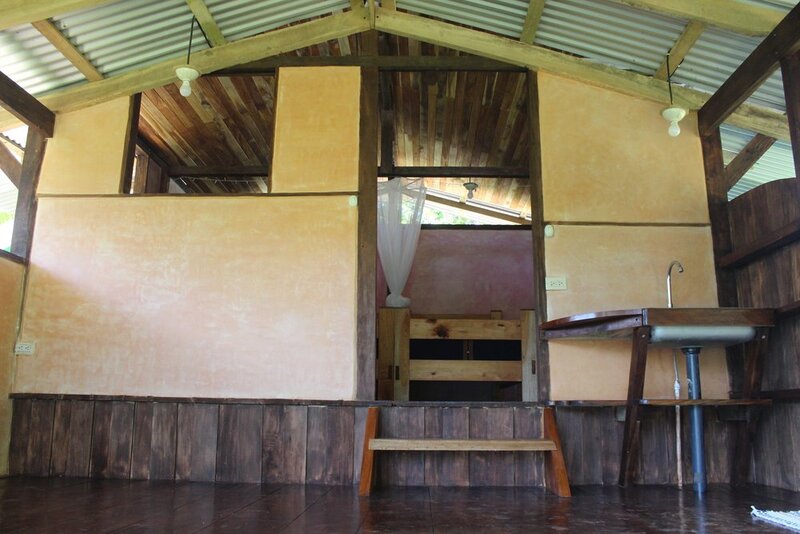 This bamboo framed structure also built using cob, wattle and daub and wood, comes equipped with a secured storage area for educational equipment, hammocks, two large tables with benches, a lab space, rocking chairs and great views into the forest and out to one of the Ranch's agricultural areas featuring bananas, pineapples and plantains. 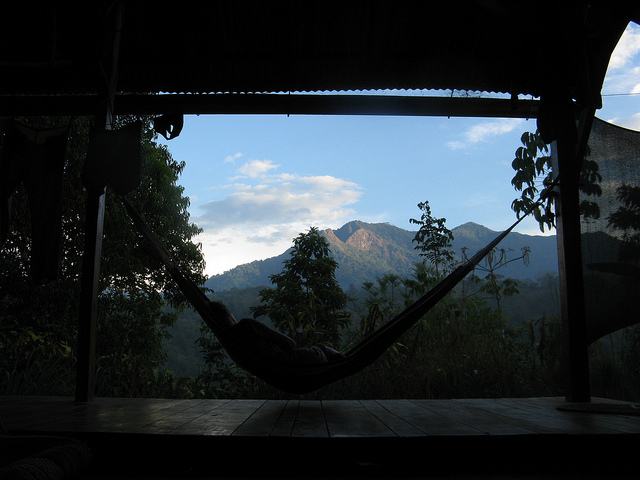 It's built on the edge of the rainforest and offers wonderful access to Jeanne's trails and house. It also boasts water and electricity, a screen for watching movies and showing presentations, and a massage table. This living structure will be home to Nic and Ali, two of the Ranch’s core team members. It’s another timber frame and wattle and daub building that was designed by Nic. The views off towards La Cangreja are some of the nicest in the region and the sunsets can be spectacular. This small timber frame and wattle and daub home sits near to Tim and Robin’s house La Choza and overlooks the La Cangreja National Park. It’s the first building where we used the Japanese wattle and daub and plastering techniques brought to the Ranch by master plasterer Kyle Holzhueter who is based in Japan. The Ranch has five composting toilets and an equal number of outdoor showers, all constructed with the same amount of care, craft, and beauty as the living structures found throughout the premises. Rancho Mastatal successfully composts almost all of the human waste generated by its inhabitants and guests and uses the rich compost throughout the permaculture farm. The use of composting toilets saves an enormous amount of precious water, provides the Ranch with valuable fertilizer and greatly reduces the stress on the Ranch's septic systems. Composting toilets are new to many people that visit the Ranch and take a little getting used to but most people leave the Ranch with a newfound love for the technology and a curiousity for how to build one at home. 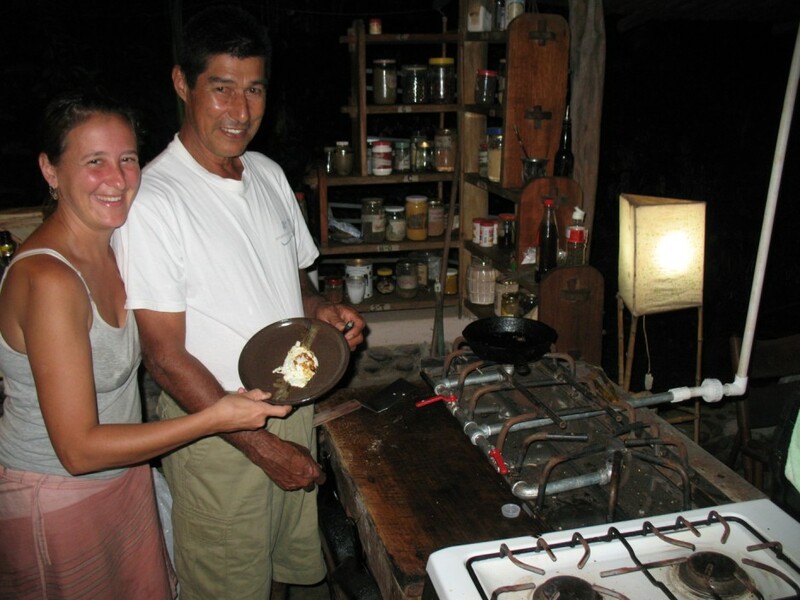 We are currently capturing methane produced from our biodigester toilet to cook with in the Ranch's kitchen. The biodigester also provides the Ranch with nutrient-rich fertilizer for our nursery and fields. We encourage as many interns and guests as possible to use the biodigester toilet so that we can maximize our methane production in an effort to reduce our dependency on imported propane. It's a simple, life-changing, eye-opening and magical little system. Jose Luis Zuniga, the organic coffee and vegetable producer who provides us with all of our java, helped us to design and build it. We are sincerely grateful for his important contribution. This system provides us with product that both enhances our vegetation and allows us to cook while keeping methane, a damaging greenhouse gas, out of the atmosphere. Another step to close the loop. We have a fully functioning work area that includes a timberframe/wattle and daub toolshed, a bamboo barn, and an open-air workshop. The structures themselves provide inspiration as well as a wonderful environment for interns and local workers to learn about natural building techniques and furniture making and work on a whole host of building-related projects. It's a comfortable, enjoyable and entertaining setting that provides countless memories for those spending time in this area of the Ranch. We have a full assortment of power and hand tools, locally sourced materials, a section on natural building in our library and competent builders on site, all which provide an ideal situation for building enthusiasts. We built a new Main House/Zone 1 nursery in 2018 during a workshop with longtime friend, builder and designer Martin Coto. The unconventional design is eye-catching and provides increased space for our front garden activities. We have a number of structures that we rent to guests and visitors. Please see here for more information about those buildings or to inquire about staying in one. We owe sincere thanks to an incredible number of people who have contributed their time, expertise and energy to make Mastatal a center for the natural building movement. Our dream of a little Hobbit Village in the middle of the rainforest continues to evolve and we hope to expand our building curriculum in the coming years. For upcoming workshops on natural building, please see our Course Calendar. Please come down and check us out and/or attend one of our yearly workshops to learn more about how you can more responsibly build.